Brazil has announced that it will cancel or restructure almost $900m (£600m) worth of debt with Africa. Oil- and gas-rich Congo-Brazzaville, Tanzania and Zambia are among the 12 African countries to benefit. The move is seen as an effort to boost economic ties between the world’s seventh largest economy and the African continent. Official data in Brazil show that its trade with Africa has increased fivefold in the past decade. 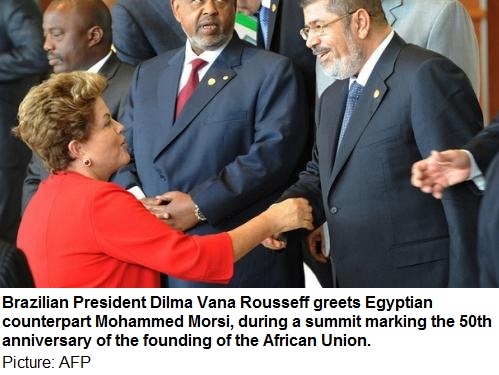 The debt announcement was made during the third visit in three months to Africa by Brazil’s President Dilma Rousseff, who attended the African Union summit in Ethiopia. “Almost all (aid) is cancellation,” Ms Rousseff’s spokesman, Thomas Traumann, told reporters. He added that most of the debt was accumulated in the 1970s and had been renegotiated before. A spokesman for Brazil’s Foreign Ministry told Efe news agency that the debt restructuring for some countries would consist of more favourable interest rates and longer repayment terms. Congo-Brazzaville owes the most to Brazil – $352m – followed by Tanzania ($237m) and Zambia ($113.4m). The other countries to benefit are Ivory Coast, Gabon, Guinea, Guinea Bissau, Mauritania, Democratic Republic of Congo, Sao Tome and Principe, Senegal, and Sudan. Brazil has been increasingly expanding its economic ties with resource-rich Africa as part of the so-called South-South cooperation. Trade between the two blocks went from $5bn (£3.3bn) in 2000 to $26.5bn (£17.5bn) in 2012. Brazilian companies invest heavily in oil and mining in Africa, and have taken on big infrastructure projects. Latin America’s economic powerhouse has also opened 19 new embassies in Africa in the last decade, and is forecast to grow 3.5 percent this year. But Brazil’s hunt for natural resources has not always been easy in Africa. Last month, hundreds of protesters in Mozambique blocked the entrance to a Brazilian coal mine in a row over a compensation deal agreed after they were displaced. Human Rights Watch, a rights group, said farming communities had been resettled on arid lands and had suffered food shortages. The Brazilian giant Vale, which owns the mine, and the government of Mozambique said improvements were being made.